Eggs are still a relatively cheap source of protein and as I have found out by dabbling in raising chickens, frighteningly plentiful at certain times of the year. It can be difficult to keep things ‘fresh’ when one has a dozen eggs a day to feed the family. 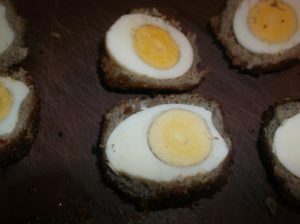 One of the ways I’ve found to keep eggs interesting is my version of Scotch Eggs. I’d say Scotch Eggs are an English dish but its origins are shrouded in mystery just as its form is shrouded in delicious sausage meat and bread crumbs in my version of the recipe. Some sources claim it comes from an Indian dish called Nargisi Kofta. Others contend it comes from a North African dish and still others claim it used to be a Yorkshire delicacy wrapped in fish paste. These days they are common pub fare, oft times served cold with relishes, pickles and salads. I recommend either using a steam based method for making the hard boiled eggs or having the water boiling and then adding the eggs to the hot water. Cook for about 13 minutes then chill in an ice bath for about 15 minutes. 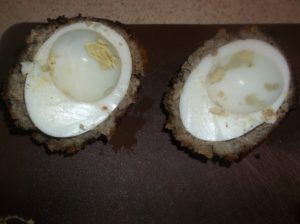 As you might have read in an issue of Cooks Illustrated, both of those methods produce reliably easy to peel eggs. I also, to hasten peeling… an onerous task to be sure, pop the chilled eggs into a resealable plastic container with about an inch of water. I close it up tight with its lid and shake it all vigorously for half a minute. This little trick speeds the process considerably. Next I take my sausage and slice it up and make thin patties. I used a run of the mill hot breakfast sausage that was on sale last time I was at the grocery store. I highly recommend some kind of spicy sausage for this recipe, it just goes so much better with the deviled yolks than sage sausage or any kind of maple sausage would. One at a time I place a hard boiled egg on a thin sausage patty and cup the sausage around the egg. Then I put a second patty on the other side and gently roll it in my hands until I have a large round ball. Do your best not to leave seems as this is where the sausage will break apart if it shrinks too much when we fry it up in the pan. 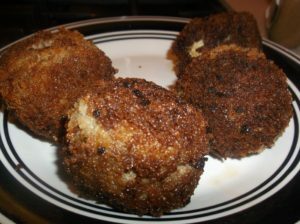 I did not wet the sausage covered egg in either egg or milk before rolling it in the panko style bread crumbs. They stick just fine to the surface with a little patting here and there. Once the eggs are assembled, I pulled out my largest deep sided frying pan and because I’m decadent I put bacon fat in the pan, enough to cover the whole bottom of the pan evenly. You can use whatever fat you prefer for pan frying but bacon fat does the job just fine and if your pan is hot very little is absorbed but the flavor. Totally edible at this stage. Heat the oil until flicking a drop or two of water into the pan produces a vigorous amount of popping. Carefully set a couple of your Scotch Eggs into the pan, being sure not to over crowd them. You will need room to roll them around ever couple of minutes until they are thoroughly browned on all sides. Don’t worry if you get a little bit of splitting as you cook them, you’ll be slicing them in half anyway so just slice them there and no one will no the difference! Drain the fully cooked eggs on some paper towels to absorb any excess grease. And just a warning based on my experience… wait a couple of minutes before deciding it’s time to slice them in half to retrieve the yolks. Those puppies are hot! Once they have adequately cooled, use a very sharp knife to carefully slice the eggs in half. Now, you are dealing with spheres instead of egg shapes and yet, without giving it much thought I managed to cut them all lengthwise. Maybe I’m just lucky and maybe someone out there who makes this recipe is going to contact me and be very irritated that they cut every single one of their eggs in some fashion that made it impossible to to continue without great difficulty. I’ll let you know. Also, absolutely consumable at this stage. Once the eggs are all sliced, pop out their yolks and place them in a bowl. I use a fork to mash them up before adding the two kinds of mustard, mayonnaise and paprika. I will give you the measurements I used for my filling but I am going to stress the need to taste test. Some mustards have more salt than others. And while I want something with enough zing to cut through the richness of the yolks and the sausage, my personal tastes might not be compatible with your palate. Always taste test before adding any additional salt at the very least. Slightly less attractive for consuming with their tasty yolk bits missing. 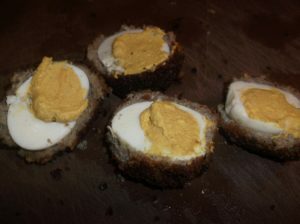 I simply used a spoon to put the deviled yolk mixture back into the Scotch Eggs. I didn’t pipe them for two reasons. One: I’m lazy. Two: The more rustic appearance of the spooned yolks just appealed to me more. Now at long last you are ready to consume! They can be eaten straight away or served cold at a later time. I store them in a resealable plastic container in the refrigerator and dole them out as needed. They rarely last more than a day. I think this web site contains some really good information for everyone : D.
Previous Previous post: Another new video up!